The weather is lovely at the moment but don't be fooled, at night it can still plummet and without the proper equipment you can really feel it when camping under canvas. We went on our first camping trip of the year at the end of May, it was dry and sunny but still very chilly at night, dropping down to around 5 degrees at night, although we did our research, invested in 3/4 season sleeping bags and while I sure some of the people on the site were freezing we were nice and snug in our tents and Mr A actually slept better than at home, going through each night without waking, tossing or turning. 1. The biggest tip we can give is create a barrier between you and the floor. I you sleep on the ground or a small foam mat you will lose body heat during the night through conduction so having a barrier such as an airbed with not only provide comfort but also insulation from the ground. We used an Eurohike double bed and it really makes all the difference, you can make camping comfortable it's just down to the choices you make. 2. 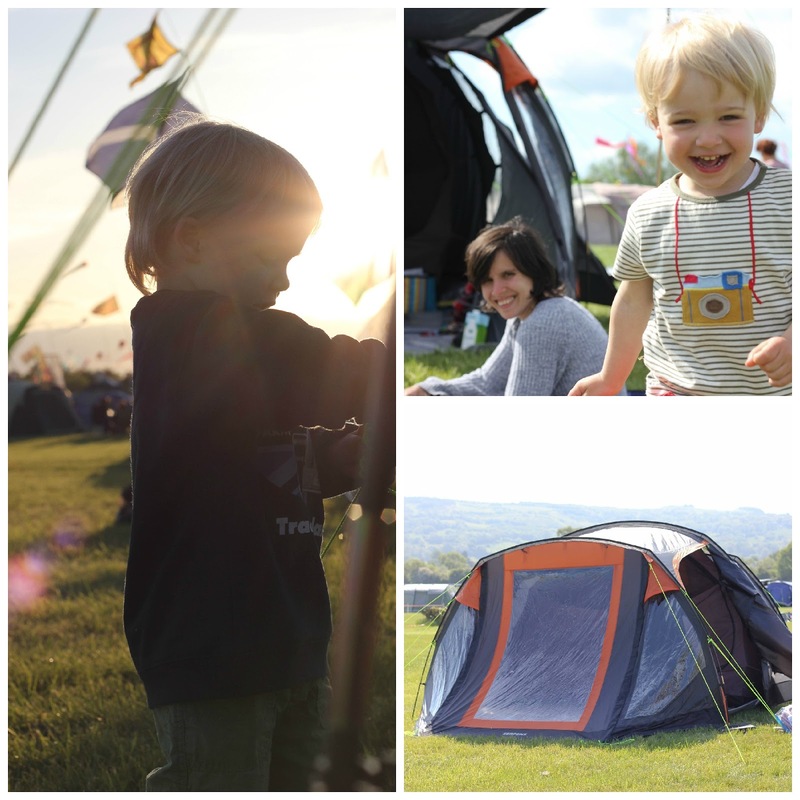 Buy a toddler sleeping bag - we used the Vango Nitestar Mini from Go Outdoors and could not have been happier with it. It's a well designed mummy style bag with the same specs as an adult sleeping bag, insuring your little ones keep nice and warm. It has a twin supper for easy access, off-set double layer construction so no cold spots can develop and it's breathable, cosy and comfortable and we are giving one away - just scroll to the bottom of the post to enter. 3. Pack extra blankets. I know you don't want to be carrying around any extra weight but if the temperature does drop you are going to regret not packing an extra layer. We took a lovely family sized fleece blanket which was really handy for night and the cold mornings. 4. Layering is key. Have light breathable layers and don't go overboard either as a child who gets hot, starts to sweat and a child who sweat later becomes cold due to being wet. Do cover extremities, we put socks on Mr A for bedtime with warm pyjama bottoms, vest, t-shirt and a hoodie - you want something that can cover there head - as this is were you lost a lot of your body heat, so packing a light hoodie is a great way to keep your little ones warm. 5. Co-sleep - we all shared the double bed, each of us in our own sleeping bag - with Mr A in the middle and a family blanket across us, this way we had our own space but also could snuggle together and use each others body heat to keep the room warm. Camping in the spring is different to the summer and we are really looking forward to more adventures under canvas. Best sleeping tip I can think of is to use a couple of fleece pajamas instead of blankets when the baby is small. Nice and cozy and don't have to worry about blankets going over his head. Oh I have never seen such a cute tiny sleeping bag! I would love to have one of those especially when mine were really small. 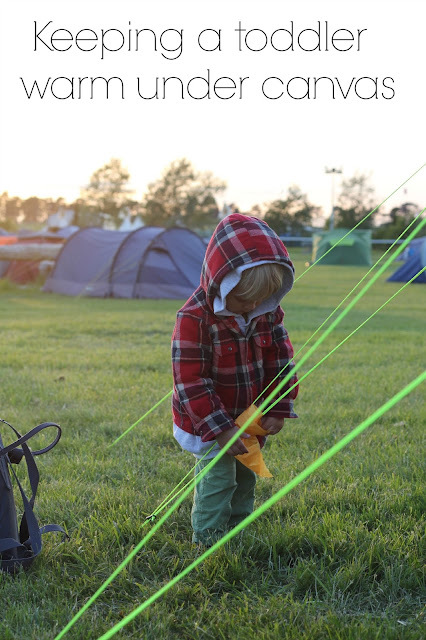 We went camping with Ronan when he was 2 and we just stuck the pack and play in the tent. It was so fun. Love camping! Great tips Laura and thank you for linking up with such a great family friend post. The best sleep tip I was given was not to respond to every cry, give them some time to settle themselves before giving them comfort. I don't know if it was this tip or that they both take after my husband, but both of mine slept through from 6.5 weeks. We like to put a duvet underneath the sleeping bags, on top of the airbed. Gives an extra layer of insulation against the cold ground. my best sleeping tip would be to make the room/area as dark as possible thank goodness for black out blinds! Give them warm milk before bed so they are full and sleepy. If they are hot fan them or dab them with a wet flannel... this helps my little boy sleep in the heat! A gentle foot or head massage as part of the bedtime routine always works well in our house. My sleeping tip is keep to routine as best as possible, even when on holiday. My tip is to make sure they're comfortable & warm. Squeaky wakes & is inconsolable if she's cold at night, so make sure they've got plenty of layers to keep snug. Absolutely adorable and incredibly practical! 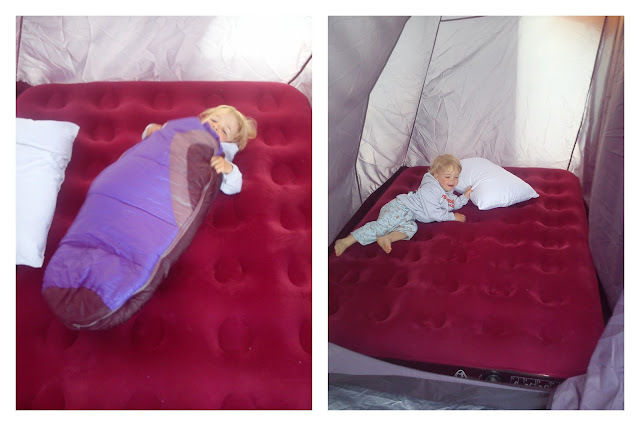 As a proponent for getting kids outside as much as possible, I love the idea and can't help but think that the double camping bed would be perfect for camping families and the Vango ideal for infants and toddlers.